As we continue our year reviewing new audio gear relentlessly, we’re keeping the ball rolling here with another great pair of in-ear monitors by Mackie that combine both affordability and overall quality. Although many are big on Mackie’s loudspeakers or studio monitor speakers, their MP series of IEM’s have gotten us very excited this past year. 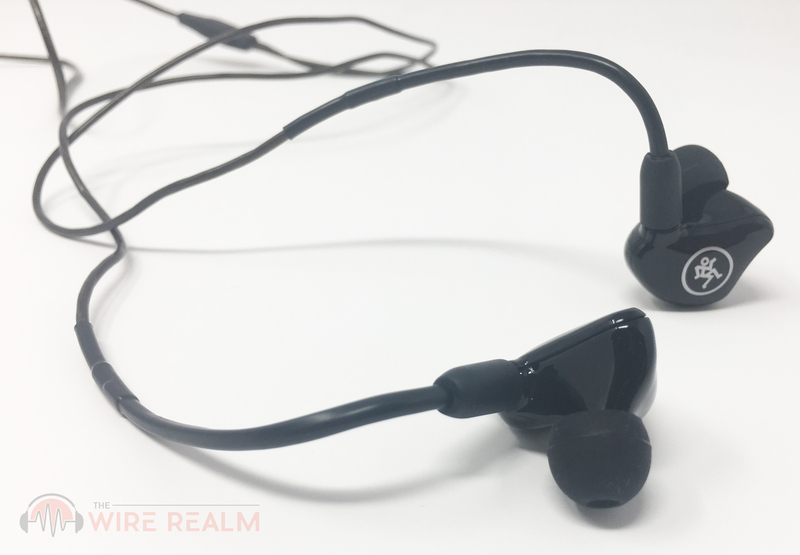 We were given a pair of the Mackie MP-120 in-ear monitors to write a fair and honest write-up today, and considering the price-point of these things, we feel they pack a very powerful punch while staying cool on our wallets at the same time. Let’s get into the details. As we’ve surveyed the entire MP series of in-ear monitors by Mackie at this point, we have zero complaints when it comes to overall build. Whether it’s the actual plug, cable or monitors themselves, we don’t see or feel any cheap material here. 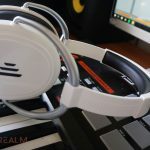 No, there isn’t any metal or aluminum, but that isn’t as common in IEMs as opposed to standard studio headphones (especially at this price-point). 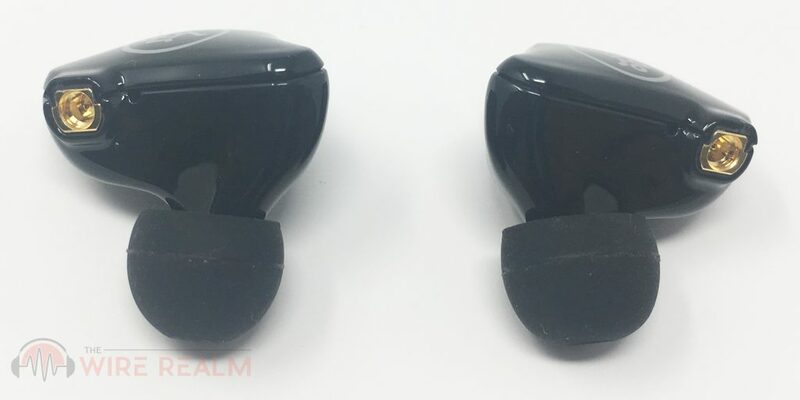 The casing of the monitors themselves are quite sturdy, and don’t scratch easily or break if thrown around (yes, we tested these by dropping them on hard surfaces and experienced no damage). At the same time, the overall cable build helps with longevity and confidence that we won’t be breaking these any time soon. They’re actually braided internally and then coated with a flexible and sturdy rubberized material. It can bend and act flexible to remain where we need it, but won’t stay too permanently if we need to move around on stage. We had no problems with versatility. In terms of wearing the monitors, you can place them either in front or the back of your ears, although with IEMs in general we prefer the back, but be our guest when it comes to preference. The ergonomic fit is great and molded low-profile design aids in not only noise-isolation but bass response and comfort as well. The top coating near the monitors themselves is form-fitting and rubberized that allows you to bend and shape them to ear your ears. You can see in the photo an additional coating on top of the rubber coating that protects the braided cable already — this is the part you can shape to your ears which can act as a ‘fin’ or ‘hook’ to ensure they stay up (these are so much better than those plastic ‘sport fins’ that come on “exercise” earbuds and in-ear headphones — we used these at the gym outside of our studio and had no problems). This will especially come in handy if you’re on stage. So what does this “single dynamic driver” term mean? We’d like to shed some light on the importance of this phrase as well as why the title boasts this feature. 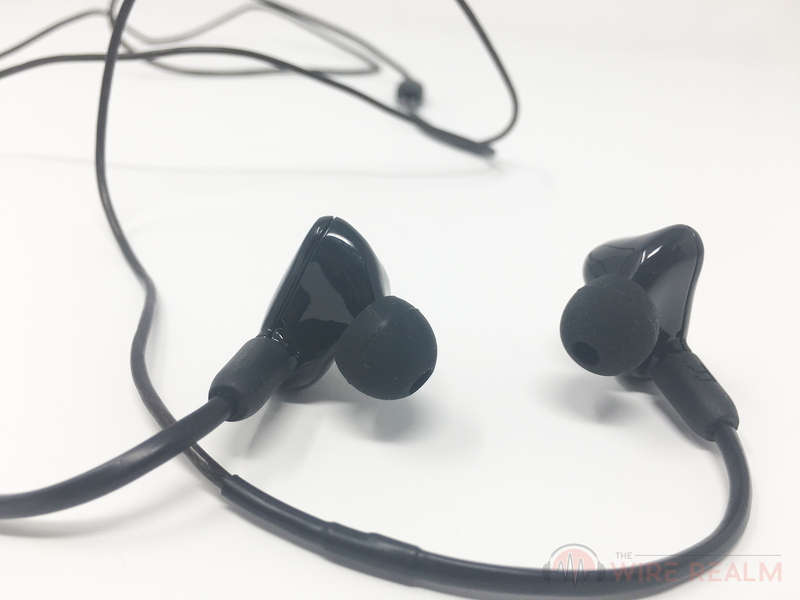 In-ear monitors altogether aren’t like “normal” “in-ear headphones” and this is mainly due to the actual build and technology of the mechanisms inside of those casings of the monitors that understand and process audio altogether. Although this particular MP-120 pair of IEMs has “one” driver (this is where their ‘series’ comes in to play — the higher you go, the more advanced and number of drivers go up), many others (that usually cost upwards to $500-$1,000 in the professional sector) can have up to 8 or more drivers all crammed into those little devices you place into your ears. In our case today, the standout isn’t necessarily the “number” of drivers or even “size”, but the “type”. 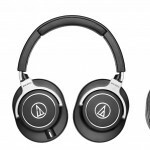 A dynamic driver is special and a lot more higher-end than most “headphones” in this price-point, which typically have cheaper and less advanced drivers (also known as transducers). 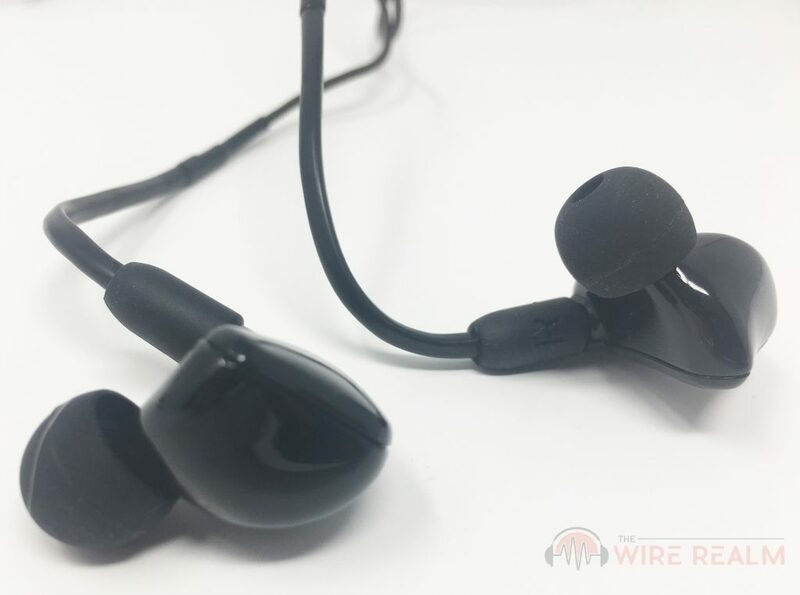 This is because dynamic drivers use a combination of neodymium magnet, voice coil as well as diaphragm attached to the voice coil to create the movement of sound and portray this into our ears, acting not only faster for processing of audio but frequency distribution as well. Aside from all that techy and advanced jargon, let’s just talk about how these things sound. Although this is the lowest model of the bunch in their MP series of in-ear monitors and isn’t necessarily as ‘advanced’ when it comes to the internal build (in particular the actual driver), the sound quality to us was excellent considering the price. When testing, we had some trip-hop playing for a while but sifted through about 3-4 genres that range in bass and treble to check out the performance of these. The low-end was first noticeable here, and although not embellished, definitely popped to our own subjective ears — the term for us that comes to mind is ‘warm’ . The higher-ends were able to come through to paint a full picture in regards to the bigger picture being bright, although the mids weren’t completely astonishing; however, this is standard with single dynamic drivers, especially in this price-range (monitors under $100, you can’t get much better than this here). 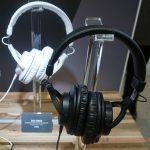 The frequency range is of an acceptable range, although we’ve seen some headphones go all the way down 5 Hz and perhaps up to 40 kHz, those are usually priced triple of the MP-120. The 20 to 20 kHz here is standard for us and we usually don’t recommend headphones that are any less. As stated previously, we noticed a dominance of both ends of the range as opposed to perhaps a blend of 3 with higher-end mids, but this still in our opinion provides a nice detailed, rich and flat sound. 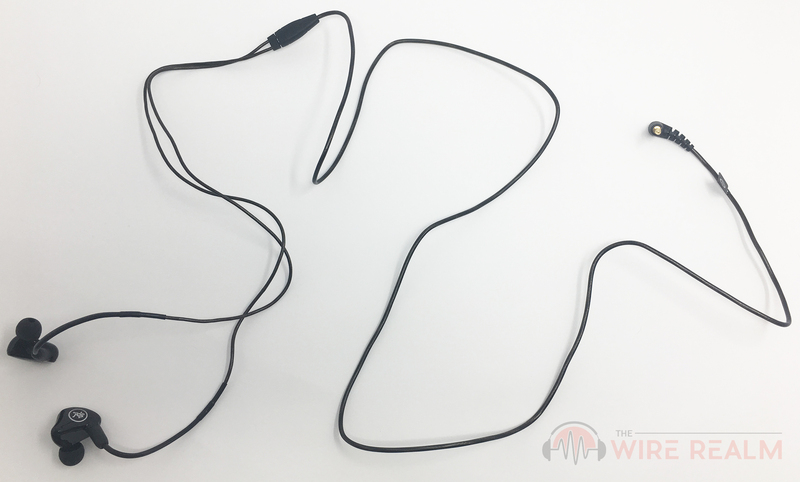 A look at the detachable cable and MMCX connectors. In terms of longevity aside from the build itself, we’re happy with the leeway we have with the Mackie MP-120 in regards to replaceable parts as well as extra accessories they provide us in the box. 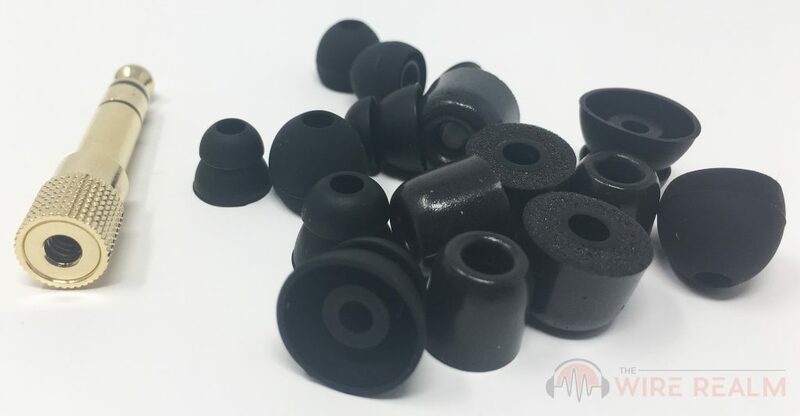 You get a total of 18 ear tips here — 3 pairs of silicone tips, 3 pairs of foam tips, and 3 pairs of dual flange tips, all with small, medium and large sizes. Our favorite is definitely the foam tips since we love the isolation it gives us and they’re less likely to slide out in our experience, but really any of these are great and it will all just depend on your personal preference (it does affect the sound as well — we’ve noticed it at times reduces the high-end, but barely noticeable. If that’s a concern, stick with the silicone or flange). If you aren’t sure of your fit yet, we recommend taking the time before you get to using these to test each type of ear tip as well as size. We usually start with the medium tips to get a good basis of measurement first and go from there. We’d recommend attempting to tug the cable from below you — if they fall out easily, go for a larger pair. The larger tips will also help with increased sound isolation since it’ll decrease the open space in-between your canals and the monitors. The detachable cables are perfect for replacement in the future if you ever need to do so. Of course, the bread and butter of the MP-120 are the actual monitors themselves, so if you end up breaking one of them you’ll have to buy a new pair (or if it’s been less than a year and Mackie is able to cover it in their 1-year warranty, you can work that out with them). 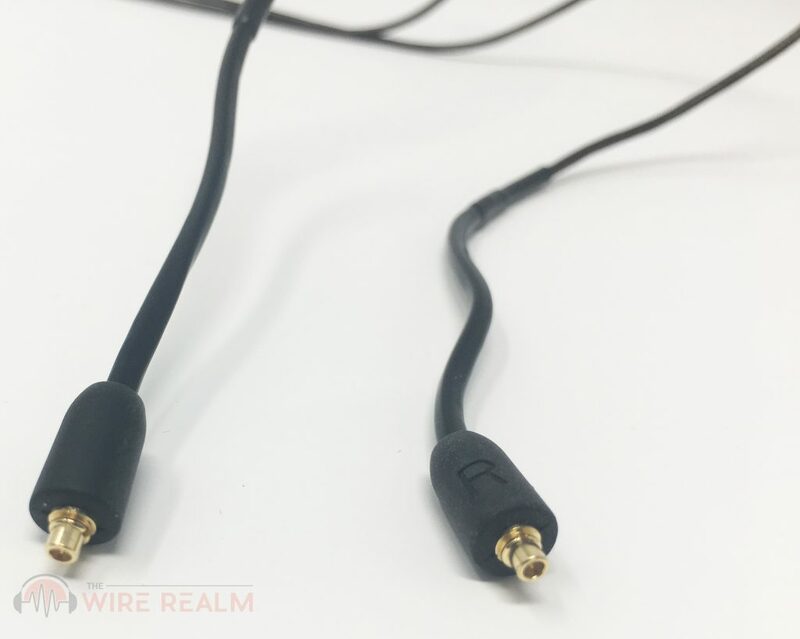 However, you can ultimately replace the cable for very cheap, or even order some more ear tips through Mackie if you need to. 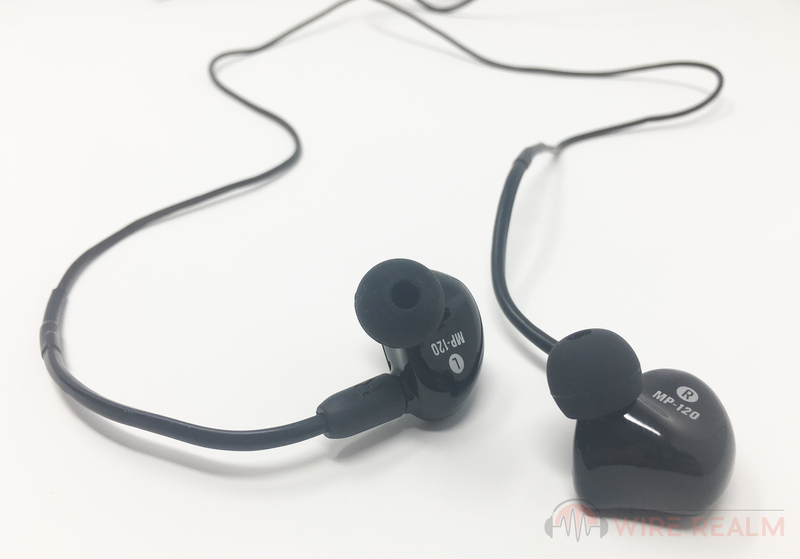 What we liked here is the MMCX connectors actually swivel, which helped give us versatility in not only for replacement but also finding a better fit to customize them into our ears. This was true especially when you first try to put these on, they can be a bit tricky but you’ll eventually get the hang of it — we’d first place in them in our ears and then swivel them into the grooves and canals of our ears. 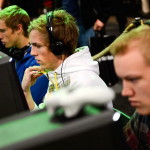 Lastly, the case we have here is a big plus to us (photos in the gallery). 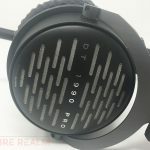 Quite a few new headphone models we’ve reviewed this year as well as in the past usually don’t come with a case, and if they do they’re typically accompanied by a cloth bag (yes, even in the professional higher-end range). 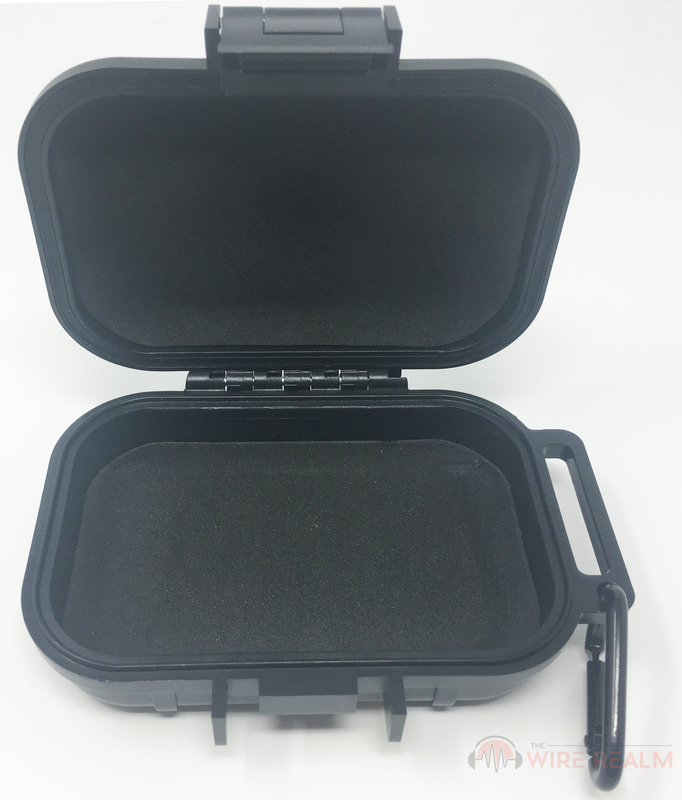 The size of the Mackie case is feasible for fitting everything into it, and the overall feel of this is a hard molded shell that’s very rugged — even if you drop it or throw it around and it happens to catch the ground, we doubt your monitors will be damaged (as long as you don’t play catch with it, of course). There’s also a convenient hook to latch it onto existing gear or even your keys if you need to keep it safe. 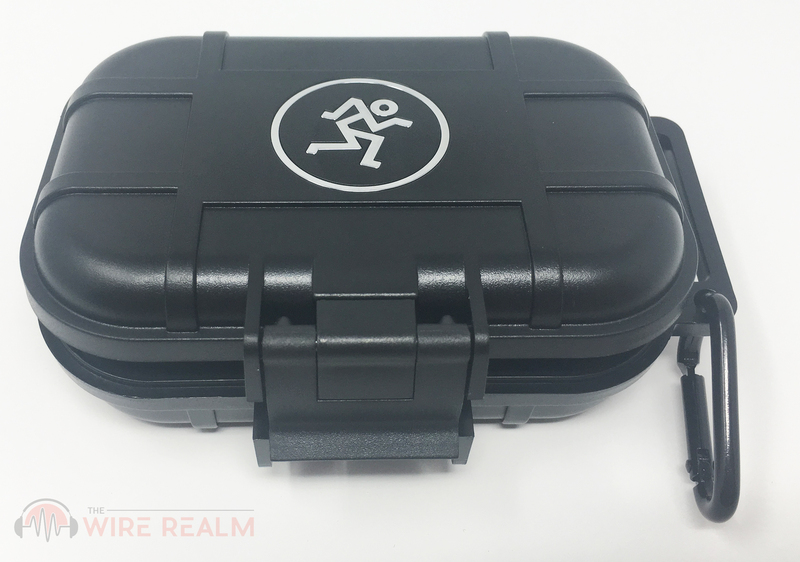 It’s big enough to carry your adapter, tips (keep them in the bag since it can get annoying), or even a few other personal items you need to bring along with you to your gigs. Your MP-120’s adapter and replacement tips. 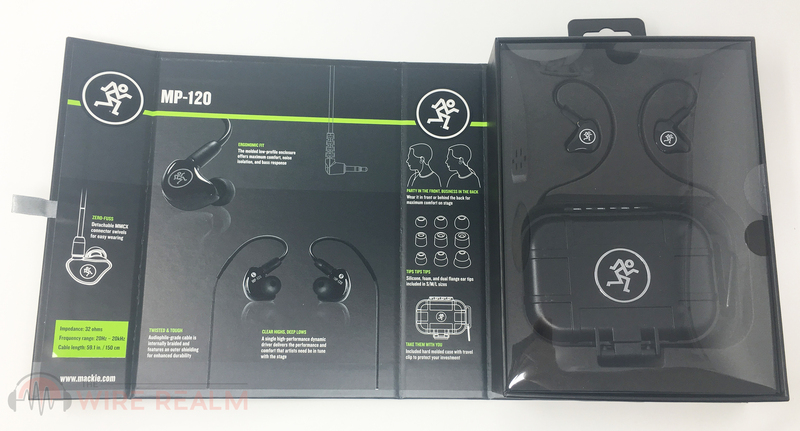 As stated previously, this is the lowest model of their three-part MP series of in-ear monitor headphones, but they’re in no way ‘cheap’ or ‘low-quality’. We’re actually impressed at how high-end these were and had expected a bit less considering they weren’t the ‘flagship model’. 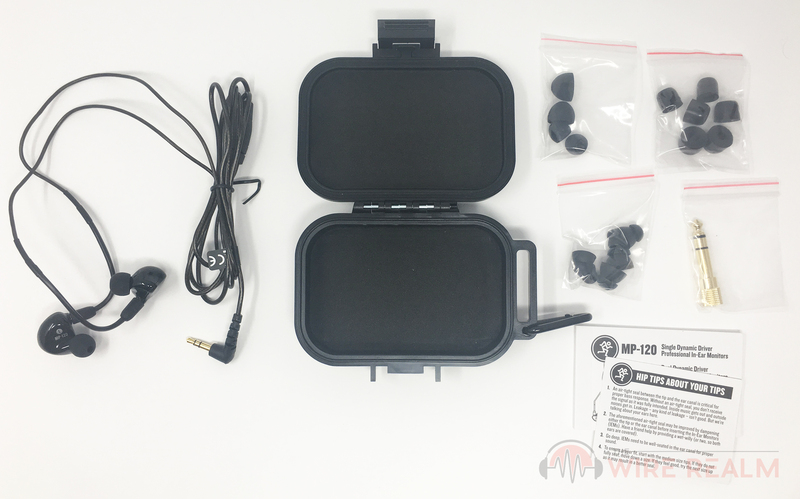 You can read our MP-220 review for more information on the next step up, and if you’re able to spend about $70 more retail, you can upgrade the drivers of these for an even better sound. No, the builds aren’t any different here and you’re still getting the same case, adapter and ear tips, as well as the replaceable cable and swiveling connectors. However, the huge difference for upgrading will be in ‘sound’ , and to us the difference is definitely substantial but may not be make or break for you. 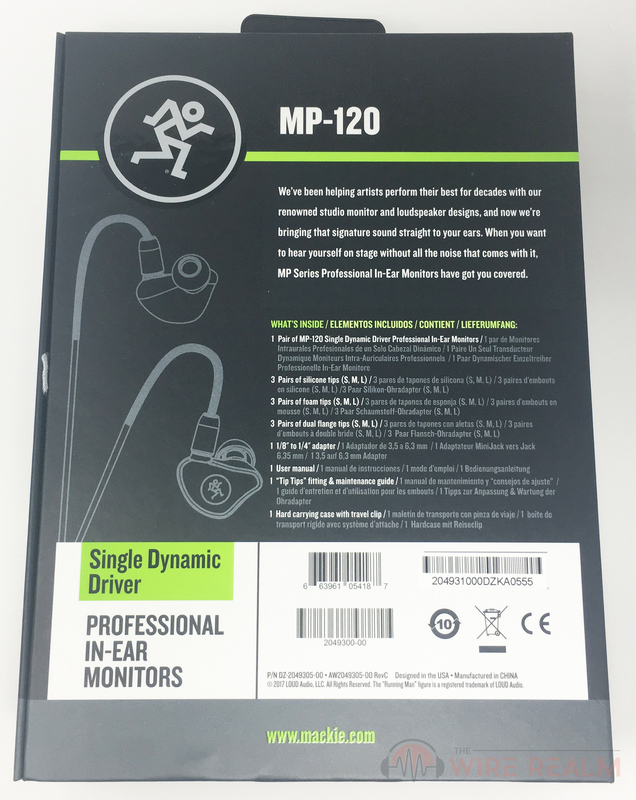 Taking a step up, the MP-220’s have a “dual dynamic driver” feature that includes two of the drivers we find in this here MP-120. 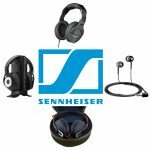 If you want to go even further, their flagship model, the MP-240, has “dual hybrid drivers” which keeps the two count but has a more advanced build by combining balanced armature drivers (higher-quality than dynamic) with a custom crossover that actually splits the frequencies into each of the drivers for even better distribution and overall clarity. These of course come with a price of $200 retail, about $120 more than these, or just $50 more than the MP-220. 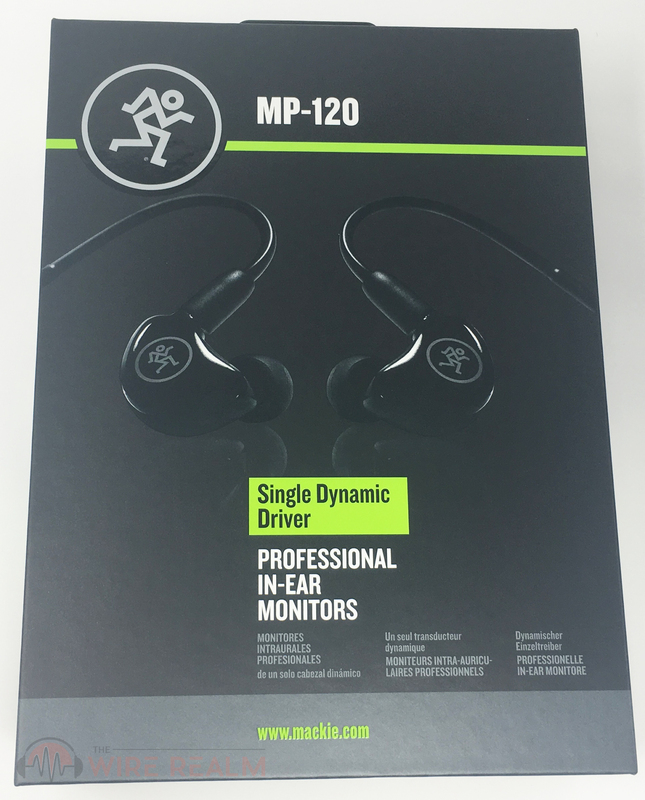 Regardless of which model you do want to go with in the MP series, the Mackie MP-120 in-ear monitors in our opinion are a beautiful pair of IEMs that definitely take the cake as the best in-ear monitors for under $100. If you’re on a budget and don’t want those “regular in-ear headphones” and care about the sound quality and balanced distribution of audio into your ears (whether you’re performing, recording or just wanting to enjoy music), these IEMs are extremely effective.